Mason’s voice is in my head: Ready or not don’t matter, honey. This is where we are. Take your time, but get it done. It is with both pleasure and sadness that I welcome everyone to the cover reveal for the final main book in the Rebel Wayfarers MC saga. There are nearly 2,000,000 (yup, that’s two million) words in the stories that make up the (currently) 22 individual titles. Book number one began in a fit of sleep-depravation in 2013, was first published in mid-June 2014, and the rest of the titles followed from there. 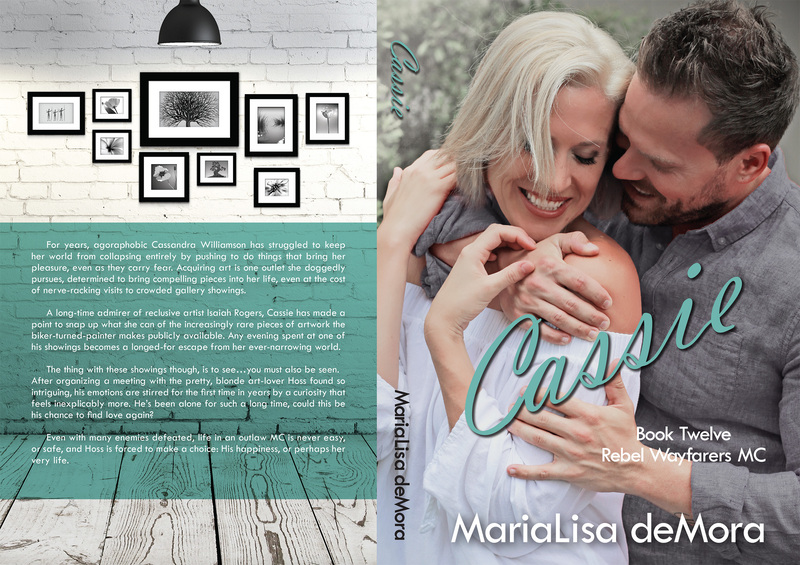 The pleasure part is of course being able to give you Cassie, book number twelve in the series. It could actually be numbered as twenty-three, because of how various characters took control through the stories. This specific book was begun immediately upon finishing writing of Hoss, book number seven, back in 2015. I picked up and put down the manuscript nearly a dozen times through that period to now, adding to the story as inspiration struck and characters demanded. The sad part? This is the final main title for the series. In essence, the Rebels end with this book. They’ve been part of my life for so long now, it’s hard to imagine things without my boys all around. But, they’ve been telling me it’s the right time for a while now, and I trust the characters. They’ve given us every story, and never steered me wrong. There have been some interesting timing aspects associated with the story, too. Serendipity, you know? In January 2016, a fan’s text to me about wishing I was at a hockey game with her sparked a flurry of writing. “I wish you was at my game tonight,” eventually helped add more than 30,000 words to the story, all from ideas derived from that single line of text. Then I found a tombstone inscription that spoke to me. “It isn’t the date on either end that counts. But how they used their dash.” Writing about the truth of that dash drove thousands of words. The whole journey’s been like that. There’s never been another story that I circled back to as often—out, around, out and back again—as I have this one. I hope it’s the better for the time spent crafting it. The cover is another example of the kind of matchless serendipity that has accompanied this book to the finish line. The main character in this story is, of course, Cassie. But her love interest and leading man has already appeared as the main character in a titled book in the series. This title is only the second one using the female character’s name, and while I considered having a single woman on the cover, I desperately wanted to honor the previous book. Also, for this book we’re jumping about fifteen years into the future, and the imagery needed to reflect that. I believe the shot captured by Eric David Battershell does all of these things. It’s a perfectly candid image of Kaitlin and Burton Hughes, real-life couple and models. The love you see in the image is honest and true, and reflects what I hope is contained within the covers. Debera Kuntz applied her wizardry and skill to the transformation of the raw shot into the polished image, and I appreciate her more than she knows. Thank you all for being part of this legacy.